Something that I didn’t expect when I started writing crime fiction was that other crime writers would be such good fun and so convivial. I’ve made some excellent friends and Martin Edwards is one of them. He knows a huge amount about Golden Age crime fiction – an interest we share – as well as being a terrific writer and it’s a pleasure to interview him for my blog. 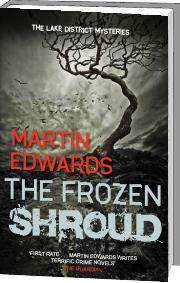 I began by asking to tell us something about his new novel, The Frozen Shroud. How do you carve out time to write? What’s your writing routine? What comes first for you: theme, plot, characters, setting? Coniston, Keswick and now (in the book I’m currently writing) Ravenglass. these tend to be implicit. that I’ve been working on for years.